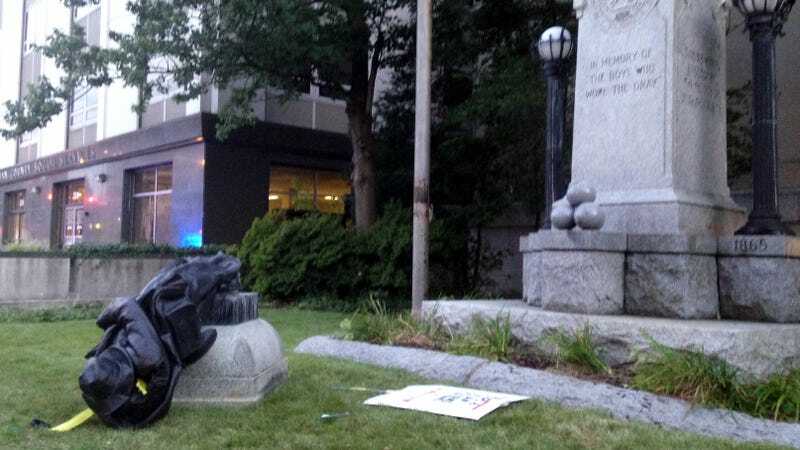 It was a satisfying thing to behold last night when protesters in North Carolina tugged down a Confederate monument outside the former Durham County courthouse, which slid easily off its base and promptly crumpled at its weak little neck. Today, police have begun arresting the protesters responsible, and they are not sorry. Thompson has been charged with two felonies—participation in a riot with property damage over $1,500, and inciting others to riot where there is property damage over $1,500. On top of that are two misdemeanors: Disorderly conduct by injury to a statue and damage to property. At the press conference, speakers called for amnesty for all involved in the statue’s removal, and for the sheriff’s office and district attorney to drop charges. They also criticized Democratic Governor Roy Cooper, who in a statement on Monday said that simply pulling down statues was the wrong course of action. In a Medium post published Tuesday, Cooper called for the North Carolina legislature to repeal a law that prevents removal or relocation of monuments. He also said he asked the Department of Natural and Cultural Resources to “determine the cost and logistics” of removing Confederate monuments from state property, as well as alternatives for the placement. Meanwhile, Durham County Sheriff Michael Andrews said additional warrants were being executed. The now damaged statue—a Confederate soldier holding a rifle—was erected in 1924. It’s inscribed with the words “in memory of the boys who wore gray.” It remains to be seen where the monument and its broken torso will go next.